It's finally time for a review! So I absolutely love Starbucks. I don't get it that often, but I'm still crazy for it. This is a review for Starbucks' Caramel Ribbon Crunch Frappuccino. This is the second time I've gotten it, because I just love it so much! 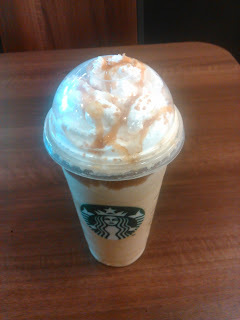 The only thing I dislike about Starbucks is that it is very pricey. This drink was nearly $6 with tax. So a Caramel Ribbon Crunch Frappuccino is caramel syrup blended with coffee, milk, and ice, then topped with dark caramel sauce, whipped cream, caramel drizzle, and a crunchy caramel sugar topping. If you do happen to try it, I'd love to know your thoughts! 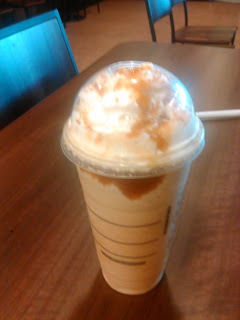 Starbucks is really good! My parents aren't really coffee drinkers though, so I never get to go. It's also pricey. 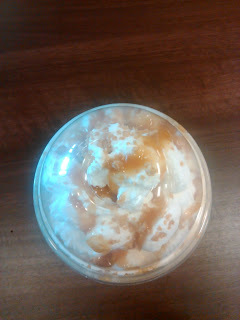 ; ) Your drink looks and sounds delicous! My family went to Starbucks only once because we had a gift card, but I don't think I got anything. So I have never eaten at Starbucks, and never intend to because I don't like what they support. Plus I would rather spend money on something else worthwhile. Time to Announce the WINNERS!! Watermark theme. Theme images by sololos. Powered by Blogger.